How to assess Carbon using Satellite Imagery: the Math and Maps behind Ecosystem Valuation. As a geospatial data consultancy with a conservation focus, we’re developing workflows that we believe will have the most conservation impact, and one of the areas we see the most promise in is in the rapid estimation of carbon stocks in a landscape. Carbon sequestration is one of the many ecosystem services intact wildlife habitat can also provide, and valuing the carbon within such ecosystems can provide an added incentive to conserve them. In a previous blogpost, we described the process of using vegetation indices to analyse satellite and drone imagery. We’re following that up with this blogpost, where we’re going to describe how carbon stocks in a landscape can be estimated by combining satellite imagery, vegetation indices and field data. A caveat up front: we’re using this blogpost to summarise some methods, to teach ourselves this workflow and to familiarise ourselves with the entire process. We haven’t collected our own field data for this process, and the maps themselves were made using regression coefficients extracted from the papers we’ve mentioned. The maps are a lie(!) but they’re also reasonably accurate depictions of what actual maps would look like if we had field data; they definitely do not reflect actual carbon stock values for these landscapes. Collecting field data to estimate carbon stocks is an essential step in the process; this information is used to develop regression equations that correlate Above Ground Biomass (AGB) as observed on the ground with information obtained from satellite imagery. As collecting field data for every pixel of the image isn’t possible, a statistical sampling process is used to obtain adequate information for the entire study area, and most papers we read described using a stratified random sampling technique. In this method, plots of the area are initially classified into classes based on specific criteria such as, for example, vegetation density. Plots from each class are then selected at random, while also accounting for other possibly related factors like species variation. Once the plots for sampling are selected, laborious field work ensues, where the biomass of individual trees within each plot is assessed. One of the most common methods to determine AGB used to be destructive sampling, where the trees randomly selected to be part of the sampling process were uprooted, and their components physically weighed. This process is expensive, labour-intensive and time consuming, and doesn’t really work when the overarching goal is the preservation of wildlife habitat. Fortunately, there’s an alternative; allometry is the science of measuring and studying the growth or size of a part in relation to an entire organism and can be used to obtain the required data non-destructively. Allometry is a very useful way to estimate tree weight from measurements of its independent parts. However, different allometric equations have to be developed for each tree species and site which makes this process complicated. The Pipe Model Theory (Shinozaki et al. 1964a,b) showed that the above ground weight of a tree was a function of the squared diameter at trunk base and wood density. This allows for the development of common allometric equations based on species which can be applied across the geographical location of the forests. Komaya et al. (2005) for example, have developed common allometric equations for mangroves which have been used across mangroves species and areas for AGB estimation, making this process much less labour intensive and much more uniform. Most AGB studies measure parameters such as Diameter at Breast Height (DBH) and tree height, which are then used to develop allometric equations by which the biomass of any given tree can be estimated. DBH is usually measured by wrapping a measuring tape around the primary trunk of the tree at a height of 4.5 feet (~150cm) above the ground. The height of a tree is estimated using basic trigonometry along with tools such as a laser rangefinder or a clinometer. We’ve assessed some of the methods that we found in the literature and consider applicable to our work. This is not an exhaustive list and if you know of any methods that you believe are efficient or effective, please let us know! As we’ve mentioned earlier, we’ve not conducted field data collection for this blogpost and are going to be using coefficients from other papers in our calculation of carbon stock. We acquired Landsat 8 imagery from December 2018 which was processed to obtain Top of Atmosphere (ToA) reflectance values. We analyzed these using vegetation indices as described in a previous blogpost and then used these index maps to replicate the carbon assessment workflows we found in the literature. Bindu et al. (2008) calculated both above and below ground biomass for a mangrove forest in Kerala. They collected field data through stratified sampling and applied common allometric equations (eq 1) for mangroves developed by Komaya et al. (2005) for estimating biomass in these field sample data sets. This ground truthing is done to establish a relationship between AGB calculated from field observations and vegetation indices calculated from satellite imagery. where ρ is species-specific wood density. The researchers used equation 2 developed by Myeong et al. (2006) as the relationship between Above Ground Carbon (ABC) and vegetation indices calculated from satellite imagery. They used their field data along with satellite data from Indian Space Research Organization’s LISS-IV satellite for their calculations. where AGB is measured in kg per pixel, a and b are constants developed from the non-linear regression. In this case, a = 0.507 and b=9.933. In mangrove forests, Below Ground Biomass (BGB) is also extremely important, and Bindu et al. (2018) found that the average ratio of BGB to AGB in their study area was 0.38. By relating AGB to BGB, they were able to estimate the total biomass and convert this into carbon values by multiplying it by 0.4759 ( which is the value this study used as the ratio of biomass to carbon). To replicate their work, we’ve created a Normalised Difference Vegetation Index map from our Landsat 8 satellite imagery, and estimated carbon stock using their methods and regression coefficients. We’ve also converted the units from kg/pixel into tonnes/hectare to compare our results with other methods. Estimating carbon from an NDVI map after Bindu et al. (2018), using their regression coefficients of a = 0.507 and b = 9.933. Laosuwan et al. (2016) studied orchards in Thailand to estimate Above-Ground Carbon directly. They used different allometric equations since they were doing this survey for agro-forestry rather than studying mangroves. For this, they collected data on height and DBH for a number of trees and combined this field data with a Difference Vegetation Index (DVI) applied on Landsat 8 imagery to create regression equations for estimating carbon stock. The exact break-down of the methodology they’ve used to develop these regression equations was not explained clearly in the paper (and we’re planning to learn more about it!) but the final equation for carbon sequestration estimated using DVI can be seen in equation 3.
where ABC is measured in tonnes/rai; one rai (a Thai unit of area) is equivalent to 0.16 hectares. Estimating carbon from a DVI map after Laosuwan et al. (2016), using their regression coefficients of a = 0.3184 and b = 0.482. Situmorang et al. (2016) used a completely different work flow to estimate carbon stocks. Their field data included the species name, number of trees, tree height and diameter at breast height (DBH). They used these variables to calculate biomass using the following formula derived from Chave et al. (2005). After Brown et al. (1996), the carbon content is estimated to be exactly half (50%) of the biomass value. Regression equations were then developed between two vegetation indices applied on satellite imagery, and carbon stock, in these sample areas to estimate Above Ground Carbon. Carbon stocks in the production forest of Lembah Seulawah district were calculated using the regression analysis equation y = 151.7x-39.7 on an EVI image and y= 204.3x-102.1 on a NDVI image. We attempted to use these regression equations to estimate carbon stock in our satellite image but these equations resulted in negative carbon stock values over most pixels in the satellite image we used. In fact, using the range of NDVI (0.17 - 0.85) and EVI (0.05 - 0.93) given by the researchers in their own study area, it seems possible that they would have also generated negative carbon values, which is a physical impossibility. We’re unsure if the researchers are using absolute values generated from their equation or if there are additional steps in the methodology not mentioned in the paper, but we were unable to recreate carbon stock estimates based on the methodology explained in their paper. Some scientists have been using LiDAR (light detection and ranging) to replace field-based surveys. However, LiDAR imagery remains very expensive and is, for the most part, inaccessible. 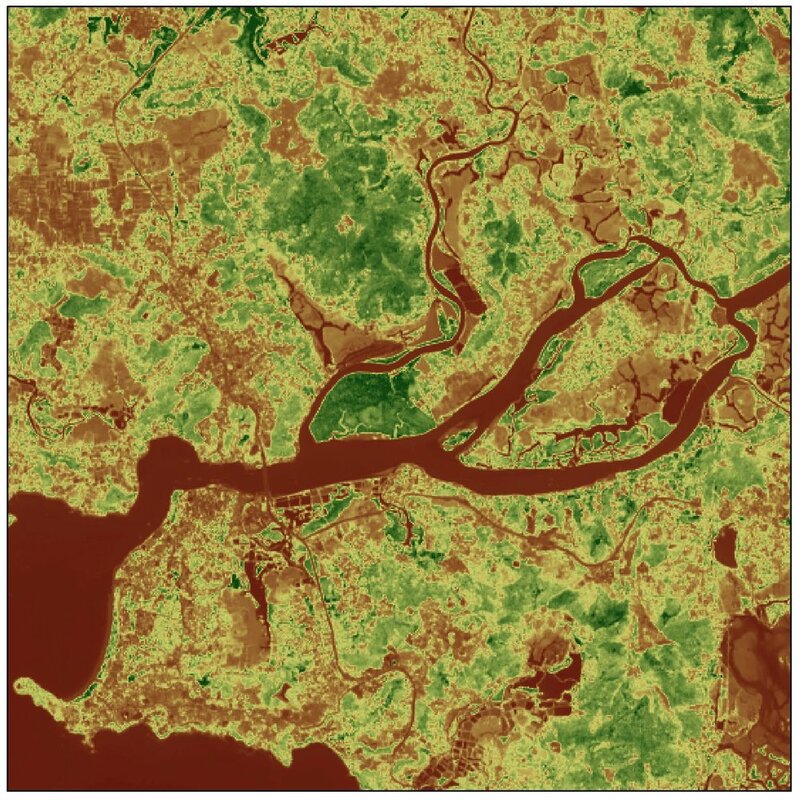 Planet, a satellite operator and provider of very high resolution satellite imagery, recently used imagery from their RapidEye and Dove satellites to estimate carbon stocks in Peru using very high resolution imagery instead of LiDAR. Their algorithm explained 69% of the variation in their study area and they found that using spatial data with more than 5m resolution could be used for calculating biomass estimates at national level. Our next post on this topic is going to be about developing methods where Unmanned Aerial Vehicles (UAVs) can be used to replace the ground-based field work. If you have any questions or comments, get in touch with us at contact@techforwildlife.com. Calculating a drone camera's image footprint OR How I learned to love tan again. When we use drones for mapping purposes, we usually program them to fly autonomously along a pre-programmed flight path, collecting images with a specified front- and side- overlap. Once we have enough images covering the area to be mapped, we stitch them all together to create the final map. This really doesn’t require us to think a lot about the length and width of each image; the only two limiting factors we usually need to consider are the final map’s (or technically, orthorectified mosaic’s) spatial resolution and the drone’s maximum legal height. However, one of the projects we’re currently working on is not so much a mapping project as it is ecological research, and to cut a long story short, ensuring that we can correctly apply a set of ecological statistical tools that account for double-counting and observer error requires us to be able to ascertain the length and width of each image at different drone altitudes. Also, as we work with a number of different drones (and thus drone cameras), I wanted to have a set of equations in place that we could use for a variety of situations. All of this required some high-school level trigonometry to work out; I was never a fan of trigonometry as a teenager, but using it to understand both the Triangular Greenness Index (as detailed in a previous post on vegetation indices) and the current problem was actually a lot of fun. To break the problem down, the two fixed variables are a camera’s field of view (FoV), which is described as the angle which it can ‘see’ at any given instant, and its aspect ratio, which is the ratio between the length and width of its images. For example, from the technical descriptions, a Phantom 3 Advanced camera has a FoV of 94° and user-selectable aspect ratios of 4:3 and 16:9, while the Phantom 4 Pro 2.0 has an FoV of 84° and user-selectable aspect ratios of 3:2, 4:3 and 16:9. In combination with the height of the drone, these two camera-parameters determine the final image footprint. For more on aspect ratios, see this post which recommends using the native aspect ratio for any given camera.
! These equations assume the camera to be perpendicular to the ground and don’t account for lens distortion. For a far more complex solution (which I have to admit I barely understand) look up this post (StackExchange) where mountainunicycler (Github user) describes nesting a Python script within Latex (what) which then calculates the FoV of a drone-mounted camera and outputs a PDF with graphics ( I can’t even.) ! to create two identical right-angled triangles). independent variable and (B) to be the dependent variable. combine equations (1) and (3), and (1) and (4). So, if we know the field of view (θ°), the aspect ratio (r) and the height of the drone (x), equations (5) and (6) allow us to determine the image footprint. To calculate the area of the image, the math is simply (A) * (B), which is the formula for the area of a triangle. To flip this around, the other equation we needed for this project was to determine the height we needed to fly the drone, given a specific image footprint i.e. given (A), calculate (x). This is straightforward, since it means we just need to make (x) the subject, as opposed to (A), in equation (5). In summary, equations (5) and (6) allow us to use the FoV, aspect ratio and height of any given camera to determine the image footprint, while equation (7) allows us to determine what height we should fly a drone at, given a desired horizontal image dimension. I’ve used these equations to create a calculator in Excel; note that Excel uses radians as the default unit for angles. Using this calculator, I can determine that with a FoV of 94°, an aspect ratio of 4:3 and a drone height of 60m, the image footprint would be 102.9m * 77.2m, while with an FoV of 77°, an aspect ratio of 16:9 and the same drone height, the image footprint would be 83.1m * 46.8m. Similarly, if I wanted an image length of 50m with the first camera (FoV = 94° and aspect ration = 4:3), I would need to fly the drone at a height of 41.25m. Let us know if you have any comments or find any errors in the math! We’re on Twitter at @techforwildlife, and you can mail us at contact@techforwildlife.com. As usual, comments on this post will be open for a few days. A majority of our ecosystem monitoring work involves acquiring, analysing and visualising satellite and aerial imagery. Creating true-colour composites, using the Red, Green and Blue (RGB) bands, allows us to actually view the land areas we’re studying. However, this is only a first step; creating detailed reports on deforestation, habitat destruction or urban heat islands requires us to extract more detailed information, which we do by conducting mathematical operations on the spectral bands available from any given sensor. For example, we can extract surface temperature from Landsat 8 satellite data, as detailed in a previous blogpost. A true-colour composite image created using data from Landsat 8 bands 2, 3 and 4. As you may imagine, understanding how much vegetation is available in any given pixel is essential to many of our projects, and for this purpose, we make use of Vegetation Indices. In remote sensing terms, a Vegetation Index is a single number that quantifies vegetation within a pixel. It is extracted by mathematically combining a number of spectral bands based on the physical parameters of vegetation, primarily the fact that it absorbs more more light in the red (R) than in the near-infrared (NIR) region of the spectrum. These indices can be used to ascertain information such as vegetation presence, photosynthetic activity and plant health, which in turn can be used to look at climate trends, soil quality, drought monitoring and changes in forest cover. In this blogpost, we’re going to provide a technical overview of some of the vegetation indices available for analysing both aerial and satellite imagery. We’ve included the basic formulae used to calculate the indices, using a bracketing system that allows for the formulae to be copy-pasted directly into the Raster Algebra (ArcMap) and Raster Calculator (QGIS) tools; don’t forget to replace the Bx terms with the relevant band filenames when doing the calculations! We’ve also noted down the relevant band combinations for data from Landsat 8’s Operational Land Imager and both the Sentinel-2’s MultiSpectral Instruments. We’ve created maps for most of the vegetation indices described below, using data from Landsat 8 acquired over Goa, India on the 28th of December 2018. Each band was clipped to the area of interest and the Digital Numbers were rescaled to calculate Top-of-Atmosphere radiance values. All the index calculations were then executed on these clipped and corrected bands. We used a single min-max stretched red-to-green colour gradient to visualise each index. For actual projects, we’d then classify each image to provide our partners with meaningful information. One of the first Vegetation Indices developed was the Ratio Vegetation Index (RVI) (Jordan 1969) which can be used to estimate and monitor above-ground biomass. While the RVI is very effective for the estimation of biomass, especially in densely-vegetated areas, it is sensitive to atmospheric effects when the vegetation cover is less than 50%, (Xue et al. 2017). The Difference Vegetation Index (DVI) (Richardson et al. 1977) was developed to distinguish between soil and vegetation, and as the name suggests, is a simple difference equation between the red and near-infrared bands. 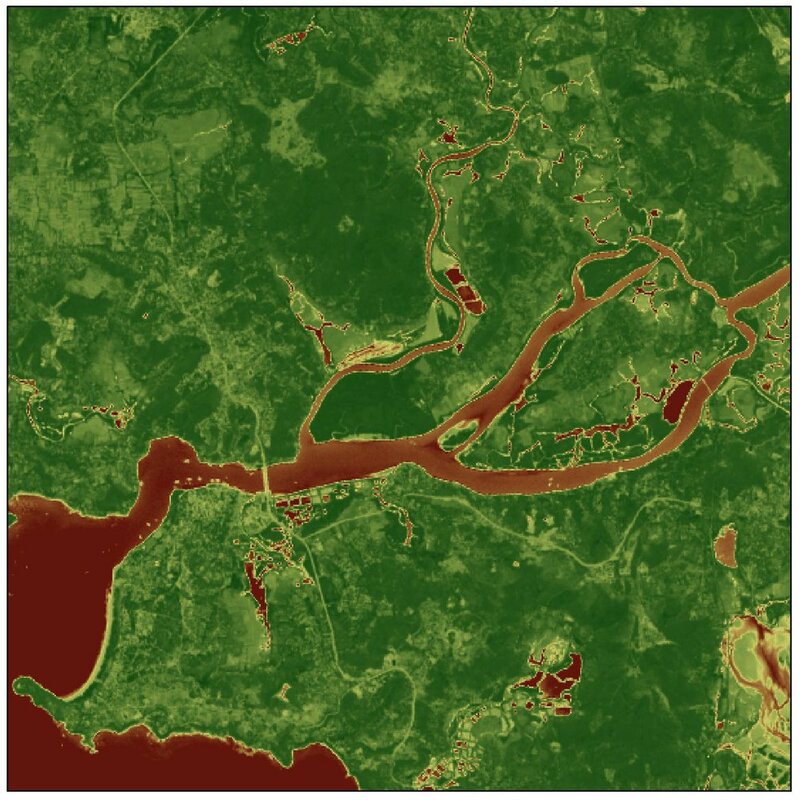 The Normalised Difference Vegetation Index (NDVI) (Rouse Jr. et al. 1974) was developed as an index of plant “greenness” and attempts to track photosynthetic activity. It has since become one of the most widely applied indices. Like the RVI and the DVI, it is also based on the principle that well-nourished, living plants absorb red light and reflect near-infrared light. However, it also takes into account the fact that stressed or dead vegetation absorbs comparatively less red light than healthy vegetation, bare soil reflects both red and near-infrared light about equally, and open water absorbs more infrared than red light. The NDVI is a relative value and cannot be used to compare between images taken at different times or from different sensors. NDVI values range from -1 to +1, where higher positive values indicate the presence of greener and healthier plants. The NDVI is widely used due to its simplicity, and several indices have been developed to replicate or improve upon it. The Synthetic NDVI is an index that attempts to predict NDVI values using only Red and Green bands. Hence it can be applied to imagery collected from any RGB sensor., including those used on consumer-level drones. Like the NDVI, its values also range from -1 to +1, with higher values suggesting the presence of healthier plants. However, it is not as accurate as the NDVI and needs to be calibrated using ground information to be truly useful. It is also known as the Green Red Vegetation Index (GRVI) (Motohka et al. 2010). Similarly, the Visible Difference Vegetation Index (VDVI) (Wang et al. 2015) can also be calculated using information from only the visible portion of the electromagnetic spectrum. Some studies indicate that VDVI is better at extracting vegetation information and predicting NDVI than other RGB-only indices,. The Excess Green Index (ExGI) contrasts the green portion of the spectrum against red and blue to distinguish vegetation from soil, and can also be used to predict NDVI values. It has been shown to outperform other indices (Larrinaga et al. 2019) that work with the visible spectrum to distinguish vegetation. The Green Chromatic Coordinate (GCC) is also an RGB index (Sonnentag et al. 2012) which has been used to examine plant phenology in forests. One of the primary shortcomings of the NDVI is that it is sensitive to atmospheric interference, soil reflectance and cloud- and canopy- shadows. Indices have thus been developed that help address some of these shortcomings. The Enhanced Vegetation Index (EVI) was devised as an improvement over the NDVI (Heute et al. 2002) to be more effective in areas of high biomass, where it is possible for NDVI values to become saturated. The EVI attempts to reduce atmospheric influences, including aerosol scattering, and correct for canopy background signals. In remote sensing terms, a saturated index implies a failure to capture variation due to the maximum values being registered for some pixels. The Atmospheric Reflection Vegetation Index (ARVI) was developed specifically to eliminate atmospheric disturbances (Kaufman et al. 1992). However, for a complete elimination of aerosols and the ozone effect, the atmospheric transport model has to be implemented, which is complicated to calculate and for which the data is not always easily available. Without integrating this model into the calculation, the ARVI is not expected to outperform the NDVI in terms of accounting for atmospheric effects, but can still be useful as an alternative to it. The Green Atmospherically Resistant Index (GARI) was also developed to counter the effects of atmospheric interference in satellite imagery. It shows much higher sensitivity to chlorophyll content (Gitelson et al. 1996) and lower sensitivity to atmospheric interference. In the formula above, γ is a constant weighting function that the authors suggested be set at 1.7 (Gitelson et al. 1996, p 296) but may have to be recalibrated in areas of complete canopy coverage. For this image, we used a γ value of 1. The Visible Atmospherically Resistant Index (VARI) can be used to account for atmospheric effects in RGB imagery. As in the case of atmospheric effects, indices were also developed to address the effects of varying soil reflectance. The Soil Adjusted Vegetation Index is a modified version of the NDVI designed specifically for areas with very little vegetative cover, usually less than 40% by area. Depending on the type and water content, soils reflect varying amounts of red and infrared light. The SAVI accounts for this by suppressing bare soil pixels. In the above equations, L is a function of vegetation density; calculating L requires a priori information about vegetation presence in the study area. It ranges from 0-1 (Xue et al. 2017) with higher vegetation coverages resulting values approaching 1. The Modified Chlorophyll Absorption in Reflectance Index (MCARI) was developed as a vegetation status index. The Chlorophyll Absorption in Reflective Index (Kim 1994) was initially designed to distinguish non-photosynthetic material from photosynthetically active vegetation. The MCARI is a modification of this index and is defined as the depth of chlorophyll absorption (Daughtry et al. 2000) in the Red region of the spectrum relative to the reflectance in the Green and Red-Edge regions. The Structure Insensitive Pigment Index (SIPI) is also a vegetation status index, with reduced sensitivity to canopy structure and increased sensitivity to pigmentation. Higher SIPI values are strongly correlated with an increase in carotenoid pigments, which in turn indicate vegetation stress. This index is thus very useful in the monitoring of vegetation health. Some indices that were initially designed for agricultural purposes can also be used for the ecological monitoring of vegetation. The Triangular Greenness Index (TGI) was developed to monitor chlorophyll and indirectly, the nitrogen content of leaves (Hunt et al. 2013) to determine fertilizer application regimes for agricultural fields. It can be calculated using RGB imagery and serves as a proxy for chlorophyll content in areas of high leaf cover. In the above equations, λ represents the center wavelengths of the respective bands; the central wavelengths of Sentinel 2A and Sentinel 2B vary slightly. The Normalised Difference Infrared Index (NDII) uses a normalized difference formulation instead of a simple ratio. It is a reflectance measurement that is sensitive to changes in the water content of plant canopies, and higher values in the index are associated with increasing water content. The NIDI can be used for agricultural crop management, forest canopy monitoring, and the detection of stressed vegetation. The Green Leaf Index (GLI) was originally designed for use with a digital RGB camera to measure wheat cover. It can also be applied to aerial and satellite imagery. As we can see, one index might be more appropriate than another based on the purpose of your study and the source of the imagery. The following section lists indices developed to meet the needs of specific research requirements. 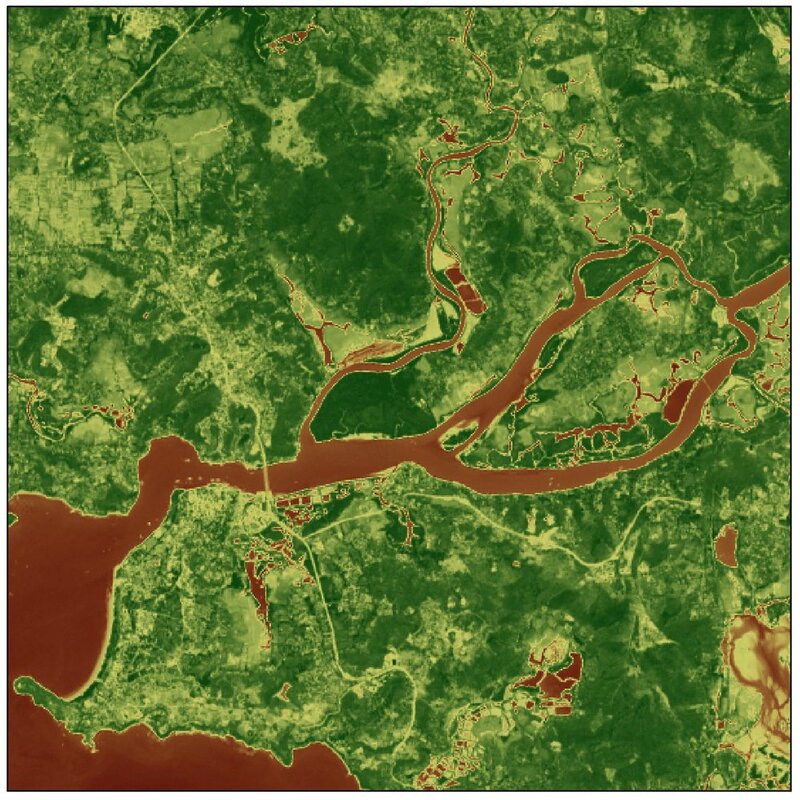 The Transformed Difference Vegetation Index (TDVI) was developed to detect vegetation in urban settings where NDVI is often saturated. Calculating square roots in QGIS Raster Calculator and ArcMap’s Raster Algebra have different syntaxes; QGIS uses ‘sqrt’ while ArcMap uses ‘SquareRoot’. The Leaf Chlorophyll Index (LCI) was developed to assess chlorophyll content in areas of complete leaf coverage. The Vegetation Fraction is defined as the percentage of vegetation occupying the ground area; since it’s calculated using values generated from a NDVI, it is subject to the same errors. It’s a comprehensive quantitative index in forest management and an important parameter in ecological models, and can also be used to determine the emissivity parameter when calculating Land Surface Temperature. In this blogpost, we’ve listed down and organised the vegetation indices that we’ve found while improving our ecological monitoring techniques. We make extensive use of both satellite and drone imagery, and will be using this blogpost internally as a quick reference guide to vegetation indices. Find us on Twitter @techforwildlife if you have any questions or comments, or email us at contact@techforwildlife.com. We’ve also opened up the comments for a few days, so please feel free to point out any errors or leave any other feedback! P.S. : Hat-tip to Harris Geospatial (@GeoByHarris) for a comprehensive list of vegetation indices, which can be found here. P.P.S. : We’ll be updating this post with Sentinel-2A imagery in the next few days. · Daughtry, C. S. T., Walthall, C. L., Kim, M. S., De Colstoun, E. B., & McMurtrey Iii, J. E. (2000). Estimating corn leaf chlorophyll concentration from leaf and canopy reflectance. Remote Sensing of Environment, 74(2), 229-239. · Gitelson, A., Y. Kaufman, and M. Merzylak. (1996) Use of a Green Channel in Remote Sensing of Global Vegetation from EOS-MODIS. Remote Sensing of Environment 58 (1996): 289-298. · Huete, A., et al. (2002) Overview of the Radiometric and Biophysical Performance of the MODIS Vegetation Indices." 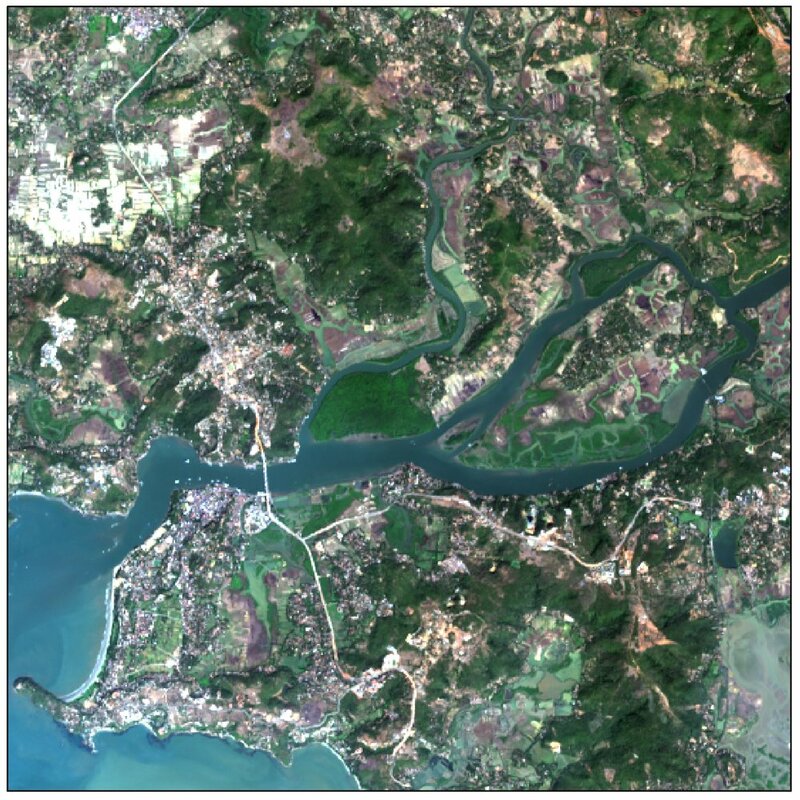 Remote Sensing of Environment 83 (2002):195–213. · Hunt, E. Raymond Jr.; Doraiswamy, Paul C.; McMurtrey, James E.; Daughtry, Craig S.T. ; Perry, Eileen M.; and Akhmedov, Bakhyt, (2013) A visible band index for remote sensing leaf chlorophyll content at the canopy scale. Publications from USDA-ARS / UNL Faculty. 1156. · J. Richardson and C. Weigand, (1977) Distinguishing vegetation from soil background information. Photogrammetric Engineering and Remote Sensing, p. 43, 1977. · Jinru Xue and Baofeng Su. (2017) Significant Remote Sensing Vegetation Indices: A Review of Developments and Applications, Journal of Sensors, vol. 2017, Article ID 1353691, 17 pages, 2017. · Kim, M. S. (1994). The Use of Narrow Spectral Bands for Improving Remote Sensing Estimations of Fractionally Absorbed Photosynthetically Active Radiation. (Doctoral dissertation, University of Maryland at College Park). · Larrinaga, A., & Brotons, L. (2019). Greenness Indices from a Low-Cost UAV Imagery as Tools for Monitoring Post-Fire Forest Recovery. Drones, 3(1), 6. · Motohka, T., Nasahara, K. N., Oguma, H., & Tsuchida, S. (2010). Applicability of green-red vegetation index for remote sensing of vegetation phenology. Remote Sensing, 2(10), 2369-2387. · X. Wang, M. Wang, S. Wang, and Y. Wu. (2015) Extraction of vegetation information from visible unmanned aerial vehicle images. Nongye Gongcheng Xuebao/Transactions of the Chinese Society of Agricultural Engineering, vol. 31, no. 5, pp. 152–159, 2015. · Y. J. Kaufman and D. Tanré. (1992) Atmospherically Resistant Vegetation Index (ARVI) for EOS-MODIS. IEEE Transactions on Geoscience and Remote Sensing, vol. 30, no. 2, pp. 261–270, 1992. We headed out to the islands in the late morning. A bike ride, ferry and short walk later, we arrived at a beautiful open grassland overlooking the river. An ideal spot for a practice drone flight. The author enjoyed the open vistas of Goa’s river islands. After a perfect afternoon of minty grass, nice wind and aerial photography, we headed back to the mainland; signing off the work day with big Thalis. That evening we attended a concert that gave us goosebumps and ended the night with pao and honey tea. The next day began at 5.30am for a beach survey in the hope of getting aerial imagery for our project with the PlasticTide (www.theplastictide.com). After a mid-afternoon break to recover from our early start, we headed for a meeting with the head of a Government Department. What we expected to be a 20 minute formal meeting turned into a 2 hour conversation which closed with some exciting prospects for work. We came back to base to discuss the meeting and then ended the day with another amazing performance at an Arts Festival. I think these two days are a useful sample to describe how my first weeks in Goa with Technology for Wildlife have been. It’s been a wonderful mix of learning, work and making the most of this beautiful state. All 3 aspects have meshed together wonderfully to make it overwhelming in the best way possible. Learning about Technology for Wildlife’s plans and clientele helped me better understand their impact model. Even in this short period, we were able to meet a variety of people, and I was introduced to a number of diverse and exciting projects. I learned a lot about the technical requirements of the work through both directed and exploratory reading as well as with hands-on practice. For example, understanding how to use a drone for mapping was completely new for me. Over the past few weeks, I’ve learnt how to operate the hardware and how to process the collected data using open source software. Working with passionate conservationists is an amazing source of learning, ideas and hope. It was wonderful to feel genuinely heard and valued, and this only added to my excitement to create further opportunities and conservation impact with Technology for Wildlife. This is a longish piece on India’s drone regulations I wrote for the Centre for the Advanced Study of India’s blog, which was also published in the Hindu Business Line on the 4th of December 2018. On October 7, 2014, India’s aspirations of becoming a global leader in the manufacture and operation of unmanned aerial vehicles (UAVs; commonly known as drones) for civilian use were seemingly crushed overnight. The Directorate General for Civil Aviation (DGCA), India’s civil aviation regulator, issued a short public notice that prohibited any non-governmental entity in India from launching UAVs for any purpose whatsoever due to safety and security issues until regulations were issued. Luckily for India’s nascent drone industry, while the notice ended by demanding strict compliance, it did not articulate the mechanisms or identify the government agencies that would be responsible for enforcing this compliance. As a result, while the ban was effective in curtailing the widespread use of drones, the regulatory chaos provided just enough space for the creation of a stunted industry. In the past four years, it has been relatively easy to contact and hire individual drone owner-operators for tasks as mundane as mapping farms, conducting event videography and taking photographs for real-estate marketing. These individuals have been able to obtain drones by purchasing them in various urban electronic grey markets, getting friends and family to import them in their personal luggage or by purchasing the required parts and building their own drones. A few businesses that have also managed to navigate the complex set of relationships required to manufacture or operate drones in India, without attracting hostile government attention, provide products and services primarily for the cinematography, agriculture, and infrastructure sectors. However, without regulations in place that guarantee the legality of their products and services, it has been difficult for these businesses to attract investors, limiting their ability to grow. 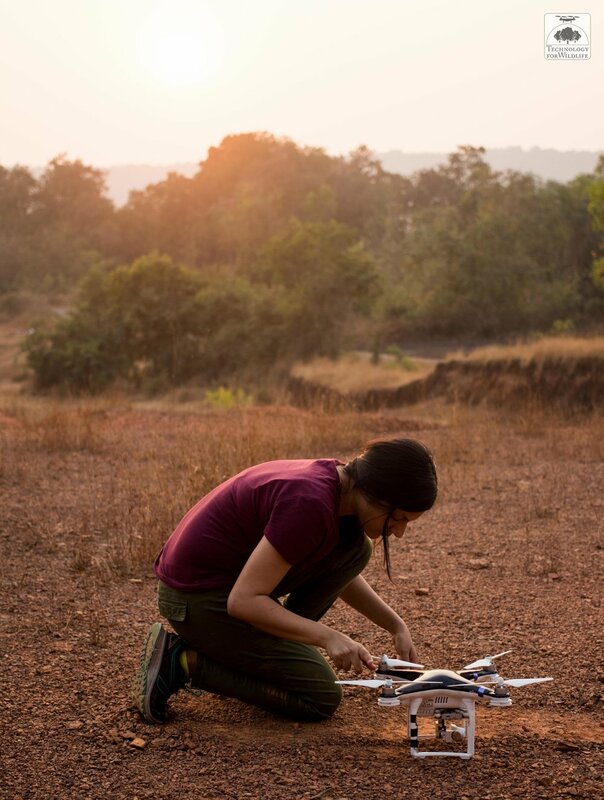 It is not surprising to note that India has no indigenous drone manufacturer capable of competing on the global stage against drone industry giants such as DJI, Parrot, and Yuneec. In the next few weeks, this may change. On December 1, 2018, the first version of India’s Civil Aviation Requirements for the Operation of Civil Remotely Piloted Aircraft Systems, also referred to as the Drone Regulations 1.0, was implemented. These regulations have emerged from two public consultations and an unknown number of private meetings, and have been vetted by many government agencies before finally seeing the light of day. This initial version makes it legal for non-governmental agencies, organizations and individuals to use UAVs for specific operations after they obtain permission from a defined set of government agencies. The Drone Regulations 1.0 also include minimum standards for the manufacture of drones, whether made in India or abroad, information on the mandatory training required by drone operators, and various permission forms for specific drone operations. Under this version of the regulations, some activities with the potential for market transformation are not currently permitted. For example, while functional drone-based delivery is considered to be a major growth area for the drone industry and is a focus for research and development—as it will have a significant impact in online retail and healthcare—it is not allowed at this point of time. This is because it requires the operator to conduct beyond visual-line-of sight (BVLOS) operations and for the drone itself to release payloads while in flight, both of which are explicitly prohibited by the Drone Regulations 1.0. However, subsequent versions of the Drone Regulations are expected to take the industry’s collective experience into account and widen the scope of permissible operations, thus eventually permitting drone-based delivery and other drone applications that are currently prohibited. The DGCA has designated a set of test sites across the country where drone manufacturers and operators can innovate in a safe and secure environment. The question remains as to whether the Drone Regulations will be able to keep up with the pace of growth of the drone industry. The primary innovation in the Drone Regulations is the introduction of the Digital Sky platform. This is an online platform where a drone operator can obtain all the necessary paperwork required to conduct an operation, including final flight permission immediately before the operation, as part of an enforcement system designated as No Permission No Takeoff (NPNT). This is an ambitious system with a number of complex moving parts, and it remains to be seen how effective this will be in practice. Aside from technical issues regarding implementation, one societal issue that the regulations as currently framed do not address is that of inclusivity. Drone applications are extremely relevant to large swathes of India’s rural population. For example, farming communities could cooperatively own and operate drones to map vegetation stress, prevent crop-raiding by wild animals, and even conduct precise spraying of fertilizers and pesticides. As currently framed, the processes and fees involved in obtaining permission to fly a drone would render it extremely difficult for them to conduct the drone operations they need most without hiring companies, which again would increase the costs of such operations. The Drone Regulations 1.0 are far more navigable by start-ups and corporations than by India’s non-governmental organizations and rural communities, which is something that must be addressed in future versions of the regulations.